Henry Lee of Friends of The Boston Public Garden. I had the honor of taking a five week "Boston Historic Parks"course by Henry Lee sponsored by the Beacon Hill Seminars. 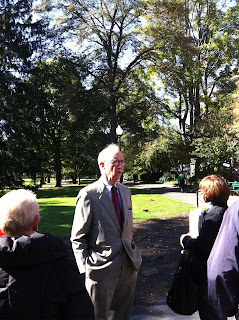 Henry Lee has just retired from his above position of 41 years as president of "Friends of The Boston Public Garden". Mr Lee is educating us to the work and expense of maintaining The Boston Common, Boston Public Gardens and The Commonwealth Mall park. He lectures on the 400 year history of these historic parks. The history of the usages of these earliest of America's public parks is Mr. lee's specialties. The use of The Boston Common as a communal cow pasture and military parade grounds came first and fore most. The use of The gardens as an escape for the congestion of the city was the next phase of usage for America's first public spaces. Finally, parks serve as public gathering grounds of fun social and political events. The historical Boston Common, The beautiful Public Gardens depicting the art work of the English gardener and its meandering paths, the orderliness of the Hausmann influenced Arthur Gilman architect's Back Bay, Commonwealth Mall are all discussed in Mr Lee's comprehensive course. The landscape design, the tree care, the past / current exotic garden design and of course the Public Art of the Boston bronze and stone sculptures are all touched upon. Mr Henry Lee is also known for his persistence and rigidity in his fight against the 10 year battle against the Park Plaza Project. Arlington St. / Beacon St. This also cometh Forth from the Lord of Hosts which is wonderful in counsel and excellent in working. What people are saying about "Boston Bronze and Stone Speak To Us"